The Zoostorm 7260-0019 has a very boring name. Zoostorm's 7260-0019 won't win any naming contests but it does provide a great performance at a very, very decent price, especially if you want to upgrade. Zoostorm is one of the few UK-based desktop PC manufacturers that has survived (and thrived) in the tablet era. It was known back in its heydays as PCNextday but changed its main brand, Zoostorm, in a move similar to what RIM did with BlackBerry. The company now sells its products essentially through third parties like Ebuyer or Amazon and the 7260-0019 desktop PC which I've been sent is actually one of its most expensive desktop PCs at …. £450 (about $700, AU$750). Out of the box, the 7260-0019 is as boring as its name sounds. The base unit is a grey mid-tower with a black facia that houses two USB ports and two audio connectors. The power button is oddly located on the top edge – not an ideal location – and there's a door hiding the optical drive. A bog-standard finish betrays what's inside. The PC comes with the usual accessories – wired keyboard, wired optical mouse, Windows, a manual and a power cable. The input peripherals are decent, the keyboard keys provide with a good feedback and the mouse is a comfortable basic model. Lift the base unit and it feels almost too light. In fact, most of the interior of this computer is empty which means a few things. Firstly, air circulates more freely in the case, making cooling easier. There's also a lot of expansion capabilities should you want to add a graphics card or a couple of hard drives. Zoostorm made it easy to pry open the tower thanks to four screws; unscrewing them frees two side rather flimsy panels, one of which is partly filed with holes to ease ventilation, a Windows certificate of authenticity is attached to the other. The tower has two free 3.5-inch bays and a free 5.25-inch one. The 7260-0019 is a powerful reminder of how far computing has evolved over the last decade. 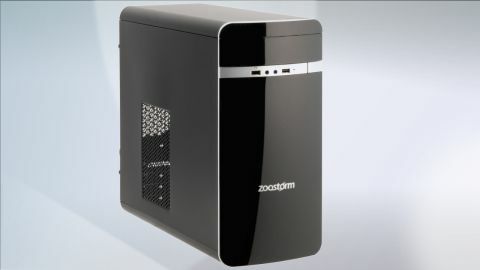 When we last reviewed a Zoostorm PC, back in 2006, it had a single core processor, 512MB of RAM and an 80GB hard drive. Eight years later and there's a quad-core processor, 16GB of RAM (on two DIMM slots) and a 3TB hard disk drive. The processor is an A10-7850K accelerated processing unit (codenamed Kaveri). It shares some DNA with the AMD chips inside both the Xbox One and the Sony PS4 as both its CPU and GPU shares the system memory. Launched in January, it has a base core clock speed of 3.7GHz, 4MB L2 cache and eight graphics compute units clocked at 720MHz. The graphics sub-system is based on the Hawaii GPU architecture that powers AMD's discrete Radeon cards. A powerful mix of hardware that shows in the benchmarks – more on that later. The microATX motherboard – a Gigabyte GA-F2A78M-DS2 - that houses the processor and the A78 chipset. It also sports a GbE Ethernet connector (courtesy of Realtek), three audio jacks – supporting a 5.1 integrated sound solution, DVI and D-Sub ports (both of which can be used simultaneously in a dual monitor mode), a PS2 connector and six USB ports (two of them USB 3.0). At least one corner has been cut though, with a 250W PSU being chosen, that is unlikely to be enough to power a decent graphics card. That a shame given that you could theoretically add a second AMD video card (an R7 200 model) and improve the graphics performance of your rig significantly.